Dr. Peters is Resident, Department of Obstetrics, Gynecology, and Reproductive Services, Magee-Womens Hospital, University of Pittsburgh Medical Center, Pittsburgh, Pennsylvania. Dr. Stuparich is Fellow, Minimally Invasive Gynecologic Surgery, Department of Obstetrics, Gynecology, and Reproductive Services, Magee-Womens Hospital, University of Pittsburgh Medical Center. Dr. Mansuria is Assistant Director of Gynecologic Minimally Invasive Surgery, Assistant Fellowship Director for Minimally Invasive Gynecologic Surgery, Associate Professor, Department of Obstetrics, Gynecology, and Reproductive Services, Magee-Womens Hospital, University of Pittsburgh Medical Center. 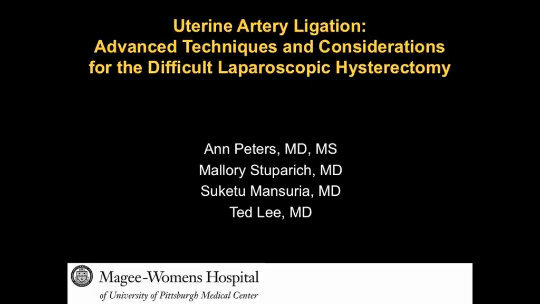 Dr. Lee is Director, Minimally Invasive Gynecologic Surgery, Magee-Womens Hospital, University of Pittsburgh Medical Center. Dr. Lee reports that he is a consultant to and a speaker for Ethicon Endosurgery. The other authors report that they have no financial relationships relevant to this video. Brought to you by the Society of Gynecologic Surgeons. Identification and ligation of the uterine artery at its vascular organ is essential to performing laparoscopic hysterectomy. The authors discuss complex pelvic anatomy and present detailed techniques using medial umbilical ligament and pararectal approaches to ligate a C-shaped uterine artery.